The power and benefits of dance are endless for all areas of life. Football player Alvin Hill suffered from a knee injury and was recommended to take yoga classes to help him recover. Soon afterwards, the yoga teacher, Collette Krogol convinced him to sign up for her ballet class at the Clarice Smith Performing Arts Center at the University of Maryland. Click below to read the article from the Baltimore Sun! Baltimore has a wonderful media resource just up the street in Owings Mills – MPT. MPT is a well-respected public television station that produces a number of nationally-syndicated programs, but what’s interesting for Baltimore dance is Artworks, which is put together by PBS stations around the country. Now starting its fifth season, most episodes are available online. Ignoring the few episodes that are awards-oriented, there are 134 you can watch online. Episodes typically feature three or four segments, and that adds up to about 474 segments in the first four seasons. Of those, 25 address dance in some form (5%). Episode 321: “On your toes – it’s the rarefied world of a ballerina,” (Samantha Lewis), retired. Take out the repeat coverage (Amy Sackett [Ep 102, 233, 404], Bill T. Jones [Ep 213, 238, 404], Mark Morris [Ep 326, 404], Cirio Collective [Ep 414, 431], and dance coverage from Artworks is just 20 segments in four seasons. A lot of it comes from Colorado (3rd law, Colorado Ballet, Frequent Flyer Productions, Wonderbound), so a nod to Colorado’s PBS affiliate. And I will close with a request – There’s a lot of dance in Baltimore (and we have more oxygen than Colorado), so make it awesome, make it newsworthy, and get in touch with MPT about getting it on Artworks. Ailey II’s Courtney Celeste Spears. Photo by Eduardo Patino. For the rest of the world, catch these awesome performers along with the rest of the Ailey II company on their current season tour. On August 20th, cash was stolen from Arabesque Dance Studio in Columbia, Maryland. Slightly more detail at Patch. I don’t know how much, and I don’t know if the perpetrator has been identified, but they do have an on-site store. If you need to buy dance-wear stuff in the near future, you might consider patronizing these dancers. Part of the Baltimore Sun’s Fall Arts Guide, a brief profile of Lynne Bellinger, principal at Ballet Theatre of Maryland. 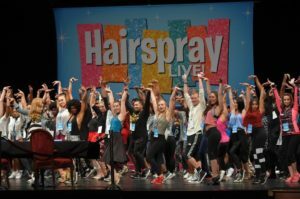 “A line of around 200 colorful “Hairspray” hopefuls wrapped around the Hippodrome Theatre on Thursday morning, each waiting for a chance to be a part of a live televised production of the Broadway musical based on the 1988 John Waters film. 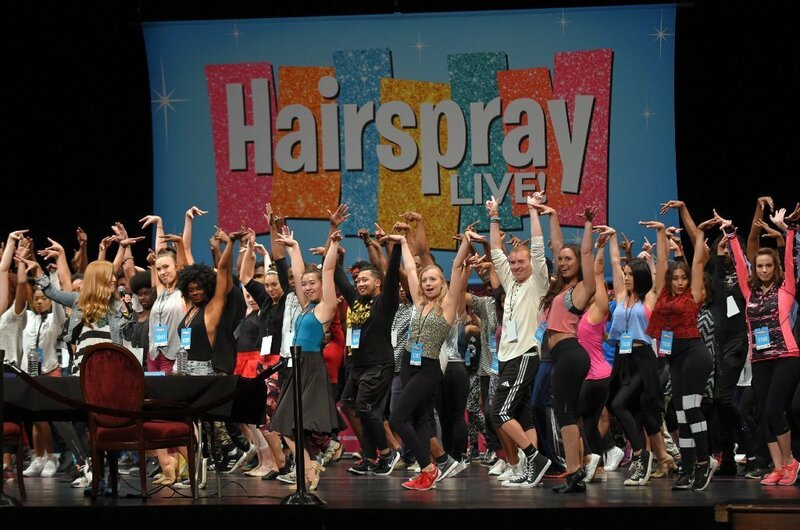 NBC was hosting auditions for “Hairspray Live,” offering one Baltimore-area resident a trip to Los Angeles and a dancing role in the show about a chubby Baltimore girl with hep moves — and a TV dance show in need of desegregation. Baltimore is the only city where the auditions will be held, according to an NBC spokeswoman, which gives local talent the opportunity to be a part of a production that is closely identified with the city. The broadcast will air Dec. 7, with a cast including Jennifer Hudson, Harvey Fierstein, Kristin Chenoweth, Martin Short, Sean Hayes, Rosie O’Donnell, Ariana Grande and Andrea Martin. Would-be stars were queuing up for the auditions by 6 a.m…” (Brittany Britto). Noelle Tolbert is the new Dance Department Chair for Chesapeake Arts Center – Congratulations! Previously noted, Chesapeake Arts Center is hiring dance instructors. Classes start in September, so if you’re on the south side of Baltimore, there’s a new place to move. With the class schedule, Chesapeake Arts Center gets a new slot here in the Learn Something list. Congratulations, class of Akimbo 2016! You have just a bit over a month to discover these artists, so… let me help you with that.